The new LG G5 is such a powerful smartphone manufactured and marketed by LG electronics. For a long time now, LG has being quite awesome producing nice and expensive handsets and well, it’s all worth it since the device is very awesome. Now lets come to think about it, the LG G-Series have being cool and we all love them that way. In other way of surprising us, the beautiful design and sleekness names the device very fantastic and awesome as we always want an advanced smartphone to be. And yeah the competition is very big. With other giants like Samsung, Sony, LG isn’t that a coward anyway because of its strength and might. 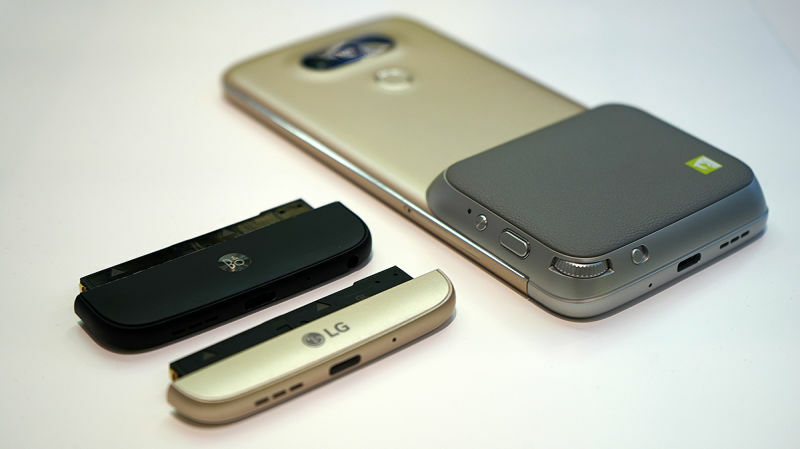 Imagine that, during the World Mobile Congress, LG released the Rolling Bot for its G5, The G5 also comes with a smart casing which all makes the companionship great and brilliant as we’ve always wanted it to be. LG G5 with all its normal cool features such as brilliant HD display and powerful camera and its spectacular volume up and down key which hides behind the device is so amazing and as usual, customers are never satisfied and so more is what we all seek. The new delivery thus covers those inquisition and therefore LG G5 stands beside the kings like Samsung Galaxy S7 in a awesome design. The battery of the G5 is another thing we’ve always hoped for to be maintained on the long run. Fans of the awesome device all will be having pleasure to purchase the upgrade of the new gadget. While assuming if its a really close rival to Samsung Galaxy S7/edge, well the conclusion might not be well driven because of the fundamentals that the Galaxy S7/Edge got covered. As the case may be, The LG G5 isn’t that much as we’ve wanted it to be though it tried getting closer. There wouldn’t be any excuse if LG refused to make this extremely standard standard like other rivals but the fact that the company made a substandard version of the device in the Latin America wouldn’t be much of an excuse. Being a modular device designed not to be that full in function but can be expandable using external modules which are made by the manufacturer, the lower part of the device’s aluminum casing can therefore be swapped and replaced for another add on like a Hi-Fi audio module or a camera grip. But this isn’t that awesome though it is to some long length. While you still hope to swap modules for another would mean switching off your gadget each of those times. LG being notable in the mobile world manufacturing is quite good at making its product cool with consumers. But in the case of the module swapping might not be really what users want as its quite risky. This fantastic innovation which is though new in the market is still not well integrated into the gadget as I have assumed. Now as the case with the swapping goes, the number is still relatively scarce in the market Although LG might have a better plan for its new innovation (LG is selling two components, but they aren’t really interesting.) Assuming there were plenty of modules and at least good partnering with third party developers, then there might be a huge market for its new modular gadget. The issue of swappable camera lens is another great feature which is cool here at Netgills as this feature is cool. So in case you prefer the camera functionality, then here you get it. Its not pretty bad for the LG G5 really as its thought to have been although. In the case with the modules, how about looking at the better parts of the device. You know better parts like the changeable battery, the aluminum casing and other in built power that makes the device quite luxurious. As it’s going to be anyway, the LG G-Series always have this awesome design that sits cool in your palm and thus makes the owning of a nice device better. Here, LG saves the day. But in the case with Samsung’s Galaxy S7/ Edge, well LG G5 might just have to withdraw a bit since that beats it hands down. Apart from the powerful battery life and processing speed which are what is needed to make a device awesome, The Galaxy S7/Edge works extremely well and yet look prettier. But on the other hand, if you still seek a device with powerful multimedia functionality, then you simply can opt in for the LG G5; you know taking photos and watching HD videos and surfing the internet can also be awesome. Well there you go. But as I will generally review this product, I will say its awesome and cool by me. The Design: As the case of Modularity goes, the time LG made us realise that its G5 will make a big impact in the market we all knew it would be exactly like that. Now being a modular device, the ability to swap modules and customize some of those hardware parts has being some imagination which we all dreamt of but LG would be the first to make that come alive and so we credit them for that. As the case with is modularity goes, you can simply swap components which doesn’t really make complete sense to you for other ones which fits in your need. Now a very good example of that would be that if you are going out somewhere like the zoo or the beach where there are gazillions of interesting things to snap and capture, you can just WAP out your camera lens for a fisheye or macro lens and doing this however demands that you push a small button which resides by the left side of the device’s edge and like a magic, the LG G5 will pop out which would allow you to slip out the attachment off the battery, clip it into the newer module and then push of back into the phone where you had removed earlier its that simple. Because the battery is attached to the bezel, the handset powers down every time you swap something out. Although we are told not to worry that much but remember, if you are in hurry then you might need to have do the shutting down and powering up earlier before the busy time comes because it takes few moments for the device to fire back up and in case you are swapper, then removing and switching modules throughout the whole day long might not be favorable to your battery life – At all. #1. The Cam Plus: This is a nice camera grip which actually have an external shutter rather than the in built graphical shutter. Now the external shutter can be used to record and capture video and a zooming wheel makes the job interesting. It also has a built-in battery, which you can use on top of the phone’s battery for extra capacity. #2. The Hi-Fi Plus: Is another portable digital-to-analog converter or simply a DAC that just do the boosting of audio playbacks for a better HD sound quality. This works well for those music enthusiasts that loss listening to songs 24/7. Since this Hi-Fi sound production is an awesome function and it can be left attached with the device if you want since it includes an audio grill, a USN Type-C port and a 3.5MM headphone Jack. In case you are a first timer in the swapping arena, the bottom bezel might be a bit stubborn but don’t force it out since its a new device and so the pieces fits in tightly and so the unlock button might have to perform the extra duty. As a top-tier handset in and of itself, the G5 is a great device. But solely in terms of modularity, it has a ways to go. Software: The device is launched this year 2016 and so will definitely come bundled with the latest Android OS Marshmallows. Though there are shortcomings as per the display since the homescreen or native LG G5 launcher doesn’t support app drawer button so all applications and software are placed on the home screen. This feature looks exactly like those on iPhone devices. In case you aren’t so used to no app drawers, then you might be quite surprised and think your gadget isn’t complete. It is LG just kinda followed other companies lime Xiaomi or Hawei footsteps. dashboard and no app drawer, or an app drawer with no dashboard and really big text. Neither choice is cool. But therefore Android itself comes to play since you can simply go to the play store and get a third party launcher which probably makes the job quite easier that’s only in case you want to really have your “used to” app drawer back. There was also a note that LG is trying to rework the App drawer back to its native launcher but fingers ate crossed as to how that will be implemented anyway. 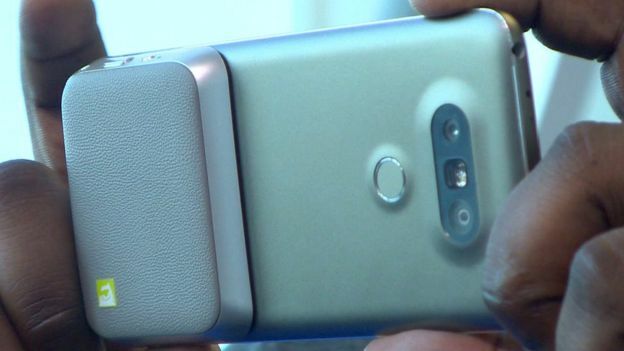 The Dual Cameras: There are two standby cameras behind the LG G5 smartphone. The first is a larger 16 megapixel camera which takes a standard 78 degree wide lens angles while the other is an 8 megapixel camera with a wider 135 degree lens angel. The wider lens lets you capture more space within each frame. Selfies are cool and having a wider degree camera lens for that might make sense since including much more spaces in your selfies will make it cooler and though the wider angle lens resides at the back and thus comes bundled with its own giga advantage. Being able to snap two versions of each scenes makes sense as it will help you decide which is better and which to forgo. General Processor speed: Running on a 820 Snapdragon Processor makes the device quick and blazing fast. It still rival other gadgets here as it comes pretty cool. Taking camera shots, playing games and swapping application for another doesn’t have any problem. This seats the G5 in a very close position near the Galaxy S7/Edge. Battery Life: The battery in this wise is very impressive and cool. Being about 2800mAh doesn’t totally means using it forever but at least its fast charge technology makes it awesome and as the case might be, you need I plugged in for just 1-hr : 10-min to get it fully charged. Surfing the internet and watching videos alongside other multitasking might still put the battery at around 40% by evening or a little lesser than that depending on your network speed and power. For a continuous video playback during airplane mode, the device might still spend up to 11 – 12 hours but in general, if you live in a country where there isn’t much of electricity, then you might get yourself a power bank and or get a substitute device in case but on the normal range, the device’s battery is awesome so far it hasn’t been swapped before you buy it. Conclusion The new LG G5 is an awesome smartphone and we love it here at Netgills. The camera overview is very awesome and the multitasking capability is incredible. The processor is speedy enough to make us feel convinced about the speed and the memory expansion is really a great feature. The HD display and the Gorilla Glass makes the external hardware a brilliant thing. The battery which is removable and can be changed in case is another power steering. The module functionality is awesome. Swapping components for another is fantastic and a great feature which even tech giants such as Google couldn’t bring to life. In general, LG G5 scores as high as 85% of incredibility and its awesome enough.